​Get to know the AQ team, ​YOUR team! Jeff Benedict has a background in the nuclear power industry as a Quality Assurance Auditor/Supervisor/Chem-tech. Jeff grew up in rural Pennsylvania on a farm and learned how to repair machinery at an early age. Jeff is a Penn State graduate. 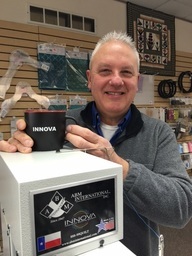 His focus at Accomplish Quilting is guiding a top-notch team with a primary focus on giving the best customer service and equipment in the industry. Jeff parents, Clarence and Loretta, founded Accomplish Quilting in 1993. Clarence has deep experience in manufacturing and engineering for his entire career working for Truck Lite, Quaker State and Roger Penske. Clarence has 15 years experience servicing Gammill Longarms and is the senior advisor to Jeff and acting CFO. Kippie has been with us since winter of 2015. She is our Administrative Assistant & is in charge of delivery schedule. She answers phone calls, takes retail orders, schedules machine service and is our all around office lead. She has held previous positions in the role of Store Manager. Brittany graduated from Hartford High School in 2015 and is currently attending Lake Michigan College. Brittany has been with us since October of 2015. When you need supplies, accessories, or parts for your machine, Brittany will make sure it gets to you! Mark has been with Accomplish Quilting since 2015 as a field technician. Mark's previous experience was as a computer counter technician and in sales for multiple major retailers. He has a strong IT background and earned his associates degree in Networking in 2014 and has a vast customer service background. Mark has excellent customer service skills. From 2005 through 2010, David worked part-time with Accomplish Quilting. During that time he developed a strong technical skill with the Gammill Long Arm Quilting Machine. Recently he retired from a corporation after 30 years of service. This Opened up an opportunity for him to join Accomplish Quilting as a full time long arm technician. 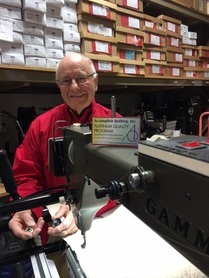 David is looking forward to a rewarding career at Accomplish Quilting in St Joseph, MI. Ashley started at Accomplish Quilting in September 2016. Her background is in sales, education and marine biology. She is a master of all of the INNOVA products and a highly qualified teacher. 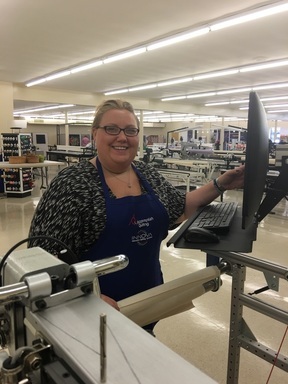 Ashley has experience in creating training videos, and she looks forward to helping customers Accomplish their quilting goals. Randy started with Accomplish Quilting in October 2016. He graduated from Taylor University with a bachelor’s degree in Art Education and has a Masters degree in Education. In addition to teaching, he has been a professional Ice carver for the past 15 years and has placed in many National and International competitions. He is highly skilled in all aspects of the INNOVA quilting machines. Randy looks forward to working with all of the AQ family in teaching classes, attending shows, and helping everyone to find the right machine to Accomplish their goals. Elaine is a native Tennessean with a background in Pre-Law and Spanish. She began making quilts and hand quilting approximately 15 years ago after her mom surprised her with a domestic sewing machine. She recently started her own business, Southern Girl Quilting, after her job of 18 years was outsourced overseas. In addition, she works part time for the Accomplish Quilting Tennessee store. Scott is amazing! Scott can repair any machine! Scott has 13 years experience in longarm quilting and in the repair and maintenance of longarm quilting machines and industrial sewing machines. Scott has quilted thousands of quilts in a t-shirt quilting factory and now brings his knowledge to AQ. Fena has been with Accomplish Quilting since September 2014. Born in Mississippi and spent her adulthood in the Chicago area, Fena was a painting contractor and interior designer in the upscale residential market of Chicago. From the age of 18 she built and marketed her own successful business for over 35 years. In her second career, she brings a entrepreneurial, "thinking outside the box" marketing spirit to AQ. She is responsible for establishing the first official marketing team for AQ. Fena oversees that marketing team and works closely with Jeff Benedict and sales. She is responsible for the website, newsletter, all written publications, advertisements and branding. She works virtually from Indianapolis and travels to all AQ stores for marketing training and event support. She is greatly involved with the interior design of our stores as well as being involved with the roll-out of new stores, new staff and each new store's marketing. Robin has a background in chemical engineering, education, and politics, and has run her own quilting business since 2003. Living in Ohio, she has contact with all members of the sales team on a daily basis. She also handles the Team Viewer sessions for customers who have questions on Auto Pilot, and is available 7 days a week for contact -- any time of the day! Now you have met the team that "Makes quilting easy!" come to one of our many classes! WE invite YOU to become a member of the AQ/Innova family!